Thronged by bodyguards, Prime Minister Netanyahu visits Israelis celebrating Independence Day at Jerusalem park. Prime Minister Netanyahu was mobbed by Israelis after making a surprise visit to a Jerusalem park. 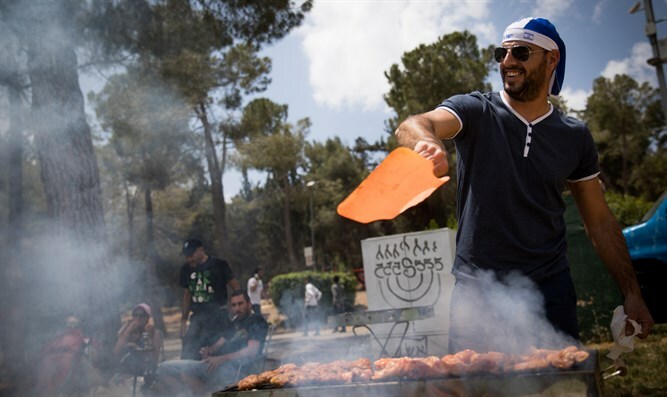 Accompanied by a phalanx of bodyguards, Netanyahu paid an unannounced to Wohl Rose Garden in Jerusalem, where he dropped in on started citizens enjoying their traditional Independence Day barbeque. Netanyahu snapped selfies with revelers and seized a karaoke microphone in order to make an impromptu speech. "Happy Holidays. Sarah and I bless you. I just want to tell you that we have an amazing country. As I said yesterday, there is none better," Netanyahu said. Netanyahu had been on his way back from the International Bible Contest for Jewish Youth, which took place at the Jerusalem Theater. The winner was Hatzor Haglilit resident Azriel Cohen, while second place went to Oriah Cohen, a resident of Kiryat Shmuel in Haifa and a student of the Bnei Akiva girls' school in Kiryat Motzkin. Bennett said during the event that one the high points of Independence Day is the Bible Quiz. "If we look at the nations of the world, we will not find any other people that celebrates its independence by championing a book. Our book is the book of books. Found in it is the essence of our independence and existence: Our identity as a nation in this land."